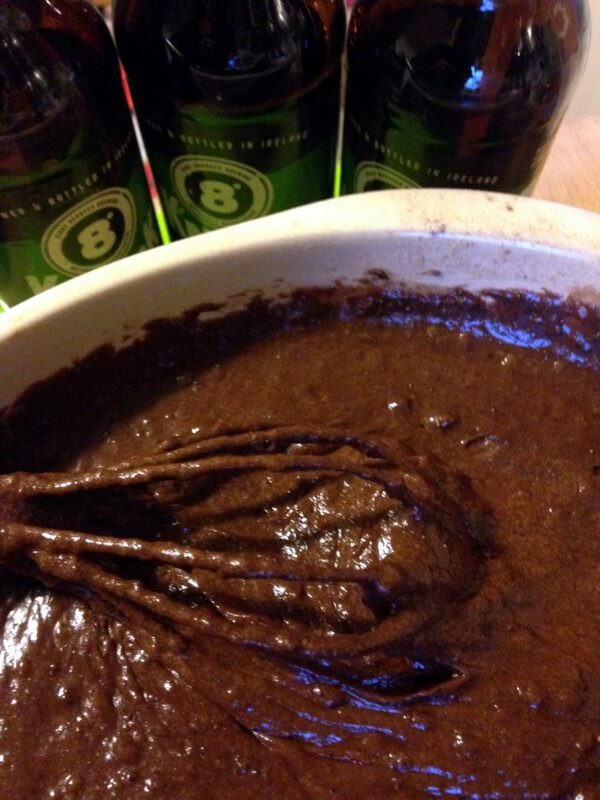 Update March 2015: These started off life in 2011 as Knockmealdown Porter Brownies but, when it came to putting this recipe in Sláinte: The Complete Guide to Irish Craft Beer and Cider, my co-author Kristin suggested calling them Double Chocolate Porter Brownies. That name that has stuck and, like the brownies, followed us around to demos and events. 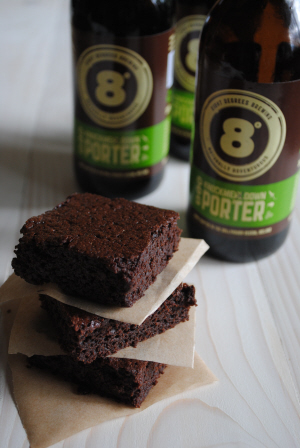 They’re still the best brownies that I’ve ever made, even if Eight Degrees Brewing have now (the nerve of them!) discontinued the porter, forcing me to use Knockmealdown Irish Stout instead. I can’t complain too much though. Similar name, even better product. Makes good brownies. Last week I was up in Dublin for the National Crafts & Design Fair in the RDS, doing a couple of demonstrations on the Cooks Academy stage in the Food Emporium. The title of my demo was Baking with Irish Craft Beer and I had a lot of fun using beers from Eight Degrees to develop recipes for Cheese and Herb Beer Bread, a Salted Caramel Ale Sauce and these Brownies. A dark, full-bodied porter or stout is a good balance to the chocolate in these brownies. I use Knockmealdown Porter (now stout) from Eight Degrees Brewing here but Dungarvan Black Rock Irish Stout, Porterhouse Plain or O’Hara’s Irish Stout are all well worth trying. You only need 250mls for this recipe, so there will be a little left over to accompany the baked brownies – that’s if you don’t drink it while doing the wash up! Rich dark chocolate + full-flavoured malty beer = the most lusciously moist brownies. Enjoy! Update September 2017: if these brownies are staying at home, in all their delicious richness, I use 100g of flour. If, however, I’m making them for an event or tasting, I increase the flour to 125g so that they don’t fall apart en route. Cool in the tin then cut into 30 pieces and store – if you have any left – in an airtight tin. These get more delectably moist the longer you keep them. Serve with a scoop of good vanilla ice cream and some warm Caramel Ale Sauce for a superb desert. Buy Sláinte: The Complete Guide to Irish Craft Beer and Cider by Caroline Hennessy and Kristin Jensen here. I know you love to use beer in cooking – hope you enjoy these! Oh just bought some of eight degrees north knockmealdown porter and was just thinking of a recipe i could use it in. I am def going to try out your one this week!! I have to say that it’s also brilliant used in meat dishes but I think these brownies definitely have the edge. Not a problem – you’d be surprised how many people call it that!